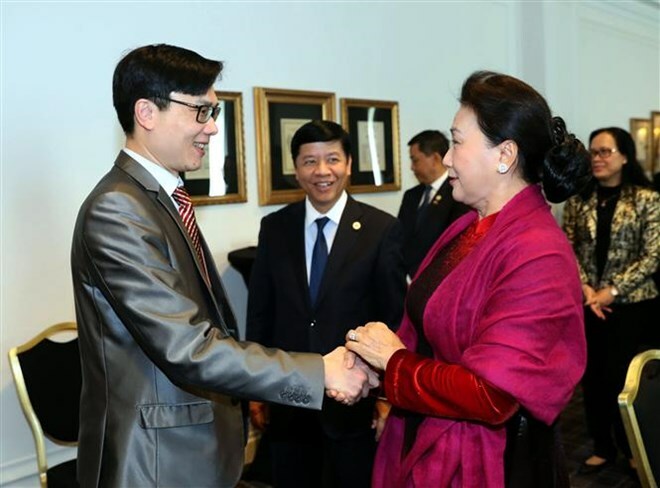 Paris (VNA) – National Assembly (NA) Chairwoman Nguyen Thi Kim Ngan on March 31 met organisers of the Vietnam Global Leaders Forum (VLGF) as part of her ongoing visit to France. The VLGT, held for the first time in Paris from March 30-31, is an initiative of the State Committee for Overseas Vietnamese Affairs and the Association of Vietnamese Scientists and Experts (AVSE). According to AVSE President Nguyen Duc Khuong, the forum gathered 200 Vietnamese nationals from 25 countries around the world, many of whom are successful in different areas. The forum aims to set up a network of Vietnamese talents around the globe to join hands in building a Vietnam of sustainable development and prosperity, he said, expressing his hope that the network will help create a breakthrough in economic development of Vietnam. Khuong told the NA leader that the forum focused on seeking measures to develop the national trademark in agriculture, tourism and innovative technology. In the context that Vietnam is targeting the development of knowledge-based economy, Vietnamese people abroad can make specific contributions to the Motherland through the promotion of the national trademark’s core values of people and brainpower, he said. At the forum, participants affirmed their solidarity for the growth of Vietnam, he said, adding that the organisers hope to seek specific ideas to develop the national trademark by helping Vietnam access the capital market and global knowledge. The AVSE leader revealed that a forum for overseas Vietnamese around the world is scheduled for the first time in the Republic of Korea in June, gathering Vietnamese entrepreneurs with an aim to boost foreign trade of Vietnam and promote the national trademark. For her part, NA Chairwoman Ngan lauded the initiatives to connect overseas Vietnamese for the shared purpose of developing the nation. She spoke highly of the aspirations of Vietnamese intellectuals to contribute to the homeland’s development. The leader held that each forum should give a specific message in conformity with development orientations of Vietnam, thus seeking practical recommendations to realise the targets.